This work is a very rare and important early work by this artist. It is inspired by the traditional designs used in the celebration of the Tingari ceremonies associated with a place south east of Lake Mackay called Pinarina. Tingari is the ancient and post-initiatory 'higher education' for Pintupi men. The teachings are conveyed in lengthy song cycles for which the designs are complementary mnemonics. The familiar and limited vacobulary of ideograms is employed subjectively so that only the artist can give a full interpretation. This he rarely does but in this instance the artist volunteered the following information. The section of the story that he had in mind when painting this work relates to the passage of ancestors from the important Tingari site at Mitukatjiri (Ligertwood Cliffs thirty miles south of Sandy Blight Junction) towards Pinari, specifically as they passed through the creek at Walunguru (Kintore Range) en route for Pinarina. It is at this spot that the artist was living when he painted this work. Tjampitjinpa has been a member of the Papunya Tula Artists for more than two decades and is now one of the organisation's most important artists. He also paints some of the most intriguing paintings to emerge from this artists group. This early painting follows the familiar and formal Tingari style of concetric icons joined by lines denoting the ancestral journeys. Tjampitjinpa now innovates within this style in a much less formal and more adventourous manner as can be seen in more recently produced works. Optical effects created by the field of Tingari patterns imbue the canvas with the desired shimmering effect which denotes spiritual power. 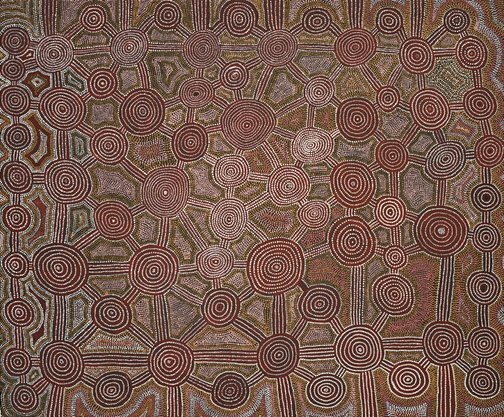 Tjampitjinpa now characteristically restricts his iconography to circular, square, or rectangular Tingari motifs, also restricting the colours of his palette. Recent paintings are bold in composition and rely strongly on the interplay between two colours. In comparison this work seems to have a greater emphasis on subtle colours and soft, subdued dotting. The dots have not been joined to form dotted lines as they are in recent work. Cara Pinchbeck, Look , 'Longing for home', pg. 29-31, Sydney, May 2015, 29 (colour illus.). Art + soul: a journey into the world of Aboriginal art , Carlton, 2010, xiv-xv (colour illus. ), 278. Education Kit - Papunya Tula: genesis and genius , 'Tingari and sandpainting', pg. 5, Sydney, 2000, 5 (colour illus. ).